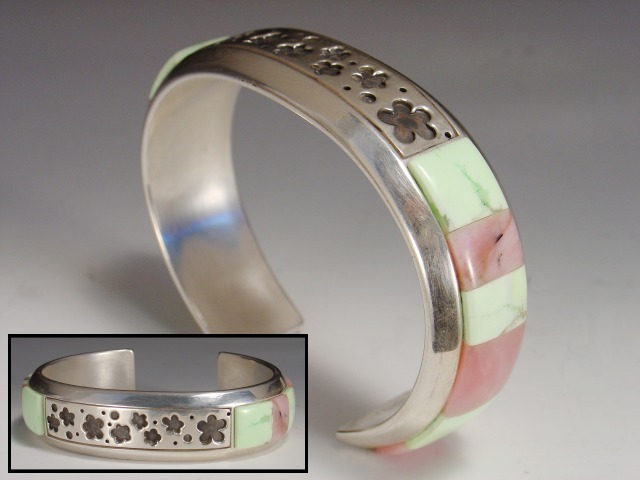 This heavy sterling braclet is hand fabricated and includes a combo of natural pastel stones. The stones are Australian Lime Chrysoprase and Peruvian Pink Opal. The flower design is a new take on a traditional overlay techinque (the flowers are individualy pierced out and overlayed onto another piece of sterling). The bracelet fits wrists size 7-8" and can be worn loose.